Additional references can be attached to a shape through resource icon References, for example, inserting a diagram, a shape and a model element. After that, you can open and view the inserted references through resource icon References. Move the mouse over a shape, press its resource icon References and select Add Diagram... from the pop-up menu. Move the mouse over a shape, press its resource icon References and select Add Shape... from the pop-up menu. Move the mouse over a shape, press its resource icon References and select Add Model Element... from the pop-up menu. Move the mouse over a shape. Click its resource icon References and select a reference to open it. If you select a shape to open, it will switch to the diagram where the shape belongs to and the shape will be selected by filled-selector. 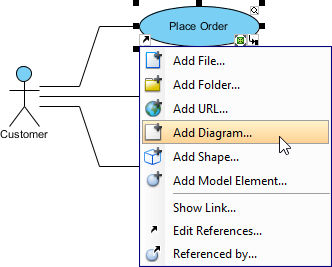 If you select a diagram to open, it will switch to the selected diagram immediately. 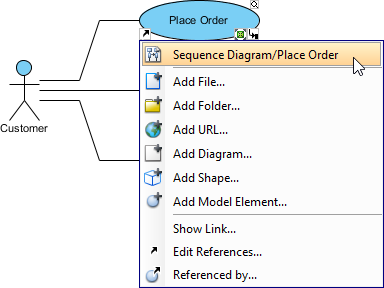 If you select a model element to open, it will open the specification of that model element.